Anyone who has witnessed an indoor cat looking out the window or lying in wait near the front door for any chance to slip outside, knows that cats are curious about the outdoors. Many pet owners would love to give their cats the outdoor experience, but a cat’s safety and well-being generally depends on staying indoors at all times. Is it possible to safely leash train your cat and give your cat an outdoor experience? By training your cat to walk on a leash it is, although it should be pursued with great caution, as there is always the possibility that your cat will manage to get away from you, regardless of how careful you are. Environmental enrichment can add to an indoor cat’s quality of life. Regardless of how many toys your cat has or how intricate your kitty condo is, a trip outside to enjoy the sounds, smells, and sights of nature with you can offer variety and challenge. Here are some tips to help turn this task into a simple and enjoyable way to share the outdoors with your furry feline. Cat harness – Because cats will slip out of a collar, use a cat-specific harness – especially a jacket-style harness – which evenly distributes the pulling force across a cat’s body, rather than focusing it on a couple of spots like a traditional dog harness. Make sure it is snug enough not to be slipped out of, or your cat will be gone in a flash. Cats can still escape from a harness! Lightweight leash – Choose a non-retractable 4-6 ft. leash for safety, make sure it is properly attached to the harness, and keep the leash end looped around your wrist. Vaccinations – Always keep vaccinations current, don’t let them lapse, including, FeLV (feline leukemia). Microchip – Be sure your cat is microchipped, that it functions properly (we can scan it at our facility), and that your information is current! Flea and tick preventive – Do protect your cat from external parasites. Treats – Bring along as, like dogs, cats respond to positive reinforcement. Start by leaving the harness out for a day or two, so your cat can get used to the sight and smell of it. Place the harness on the cat and adjust for comfort, offering treats to create a positive association. Keep the harness on for longer and longer periods of time. Be sure to supervise your cat while the harness is on — NEVER leave your cat alone and unattended with the harness on. When your cat is used to the harness, attach the leash. You can hold the leash lightly or let your cat drag it as he or she walks (don’t allow the leash to tighten just yet). Continue to offer treats to entice your cat to walk forward with the leash attached. Now you may give the leash a light pull, and then lure your cat forward with a treat for a few steps before offering it. 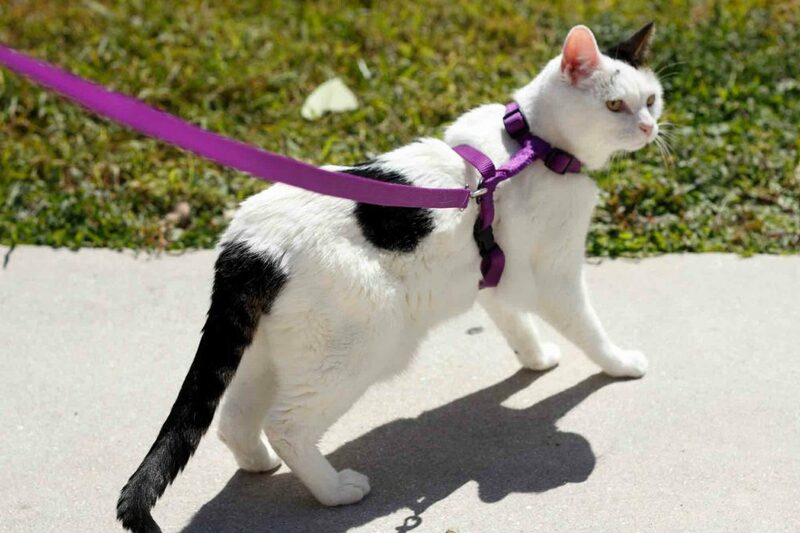 This teaches your cat to walk forward when the leash is pulled. Now you’re ready to head outside! Start with an orientation to your back patio or yard. Then, attempt a short trip around the yard. A next step can be to explore the perimeter of your home. Ideally, these first experiences should be low on stimuli, so your cat has a chance to get used to being outdoors. For most people, hanging out in an enclosed yard is enough of an outdoor experience, and it is the safest place to do it. However, if you and your cat are comfortable walking with the leash, you may wish to take a short walk beyond your yard, increasing the duration of the walks gradually. Remember, walking a cat is not like walking a dog! The pace will be much slower and your focus will be on observing your cat and following his or her lead. Your cat may decide to sniff grass or plants, meander along an irregular path, or frolic with delight in the open air. No matter what he or she does, stay alert to all behaviors and take any cues of anxiety or stress seriously. Cut it short if these materialize. Always be on guard for a loose dog or other animal, as your cat is very vulnerable. You should always avoid contact with other animals. Not all cats are suitable for exposure to the outdoors and not all cat owners will want to take on the risks, so you should discuss outdoor exposure with your veterinarian first, as he or she may advise against it. Another Precaution: Be aware, that exposing your cat to the outdoors will likely increase your cat’s desire to be outdoors! You’ll need to take extra precautions whenever you are using doors leading to the outside, in order to keep your cat from sneaking out on its own. Are you planning to leash train your cat? Let us know by posting on our Facebook page (don’t forget to include a photo)! Filling in the Blanks: Do Pets Get Cavities? Copyright © 2019 Lone Tree Veterinary Medical Center. All rights reserved. Veterinary Website Design by Beyond Indigo Pets.